Finished in the colour of your choice! Our elegant Katie Double Ended Chaise Longue offers a perfect combination of luxury and comfort. 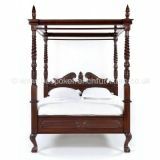 It is made from solid mahogany and is finished/upholstered in the UK resulting in an exceptional piece. 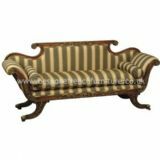 This style is also available as an armchair, as a petite chaise or as a single ended chaise longue. 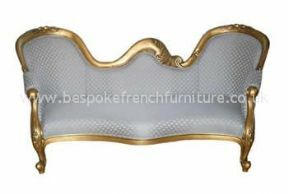 The price for the chaise longue shown here with a gilt finish is an example of a previous order and applies to similarly finished pieces. Should your order require more work or more expensive coverings then the price will need to be adjusted accordingly. Please contact us for a quote. Colour/Finish: As shown or your choice of colour and your choice of fabric. All images and text on this website are the property of Bespoke French furniture and are copyright protected.